Since the fall of the New Babylonian Empire around 548 BC. Mesopotamia was ruled by foreign dynasties. Among the various empires and dynasties, the Seleucids, Sassanids and Arabs have build their own new capitals in Mesopotamia and ruled their vast empires from there. Seleucia, as such, was founded in about 305 BC, when an earlier city was enlarged and dedicated as the first capital of the Seleucid Empire by Seleucus I Nicator. Seleucus was one of the generals of Alexander the Great who, after Alexander’s death, divided his empire among themselves. Although Seleucus soon moved his main capital to Antioch, in northern Syria, Seleucia became an important center of trade, Hellenistic culture, and regional government under the Seleucids. The city was populated by Greeks, Syrians and Jews. Standing at the confluence of the Tigris River with a major canal from the Euphrates, Seleucia was placed to receive traffic from both great waterways. During the 3rd and 2nd centuries BC, it was one of the great Hellenistic cities, comparable to Alexandria in Egypt, and greater than Syrian Antioch. Excavations indicate that the walls of the city enclosed an area of at least 550 hectares (1,400 acres). Based on this size, the population has been estimated to number over 100,000 initially and probably more later. Its surrounding region might have supported half a million people. In 117 AD, Seleucia was burned down by the Roman emperor Trajan during his conquest of Mesopotamia, but the following year it was ceded back to the Parthians by Trajan’s successor, Hadrian, then rebuilt in the Parthian style. It was completely destroyed by the Roman general Avidius Cassius in 165. Ctesiphon (Persian: تيسفون‎, Tīsfūn; Arabic: قطيسفون‎, Quṭaisifūn; others) was the imperial capital of the Parthian Empire and the Sasanian Empire. It was one of the great cities of late ancient Mesopotamia. It was situated across the Tigris from where the Greek city of Seleucia stood and northeast of ancient Babylon. Today, the remains of the city lie in Baghdad Governorate, Iraq, approximately 35 km (22 mi) south of the city of Baghdad. Ctesiphon was the largest city in the world from 570 AD, until its fall in 637 AD, during the Muslim conquests. Because of its importance, Ctesiphon was a major military objective for the leaders of the Roman Empire in their eastern wars. The city was captured by Rome five times in its history – three times in the 2nd century alone. The emperor Trajan captured Ctesiphon in 116, but his successor, Hadrian, decided to willingly return Ctesiphon in 117 as part of a peace settlement. The Roman general Avidius Cassius captured Ctesiphon in 164 during another Parthian war, but abandoned it when peace was concluded. In 197, the emperor Septimius Severus sacked Ctesiphon and carried off thousands of its inhabitants, whom he sold into slavery. Late in the 3rd century, after the Parthians had been supplanted by the Sassanids, the city again became a source of conflict with Rome. In 283, emperor Carus sacked the city uncontested during a period of civil upheaval. In 295, emperor Galerius was defeated outside the city. However, he returned a year later with a vengeance and won a victory which ended in the fifth and final capture of the city by the Romans in 299. He returned it to the Persian king Narses in exchange for Armenia and western Mesopotamia. In c.325 and again in 410, the city, or the Greek colony directly across the river, was the site of church councils for the Church of the East. After the conquest of Antioch in 541, Khosrau I built a new city near Ctesiphon for the inhabitants he captured. He called this new city Weh Antiok Khusrau or literally, “better than Antioch Khosrau built this.” Local inhabitants of the area called the new city Rumagan, meaning “town of the Romans” and Arabs called the city al-Rumiyya. Along with Weh Antiok, Khosrau built a number of fortified cities. Khosrau I deported 292,000 citizens, slaves, and conquered people to the new city of Ctesiphon in 542 C.E. Emperor Julian was killed following a battle outside of the city walls, in 363, during his war against Shapur II. Finally, in 627, the Byzantine Emperor Heraclius surrounded the city, the capital of the Sassanid Empire, leaving it after the Persians accepted his peace terms. Ctesiphon became the capital of the Sassanids in c.224 and a center of Nestorian Christianity. Ctesiphon surrounding areas were inhabited mainly by Arameans, Syrians, and Arabs, who spoke Aramaic and were predominantly Christian or Jewish. Both the Jewish exilarch and the Nestorian catholicus resided in the city, and in 410 a Nestorian synod was held there. It was in Seleucia-Ctesiphon that the major part of the book Talmud, which to the Jews is considered second only to the Bible, was written and in the Aramaic Language.The Zoroastrian Persian ruling class, on the other hand, was in the minority. Curiously, none of the major fire temples was located in Sassanian Mesopotamia. Ctesiphon fell to the Muslims during the Islamic conquest of Persia in 637 under the military command of Sa’ad ibn Abi Waqqas during the caliphate of Umar. Still, as political and economic fortune had passed elsewhere, the city went into a rapid decline, especially after the founding of the Abbasid capital at Baghdad in 763 AD, and soon became a ghost town and its deserted ruins were used as a quarry for building materials used to build the new Abbasid capital. Ctesiphon is believed to be the basis for the city of Isbanir in the tales of One Thousand and One Nights. The ruins of Ctesiphon were the site of a major battle of World War I in November 1915. The Ottoman Empire defeated troops of Britain attempting to capture Baghdad, and drove them back some 40 miles (64 km) before trapping the British force and compelling it to surrender. Altough Ctesiphon was build and considered to be the administrative capital of the Sassanid dynasty, during the 1st century A.D. it became the center of Christianity in Mesopotamia and the Nestorian church of the whole empire and beyond. It continued to be as such for over a century long after the Arab Muslims captured it in 637 A.D. Following the tolerance of the Persian Sassanian King Yazdegerd I, which for a period of 70 years, the Christians set about reorganizing and strengthening the church. The Council of Seleucia-Ctesiphon (The Synod of Mar Isaac) met in 410 AD under the presidency of Mar Isaac, the bishop of Seleucia-Ctesiphon. The most important decision of the Synod which had a very far reaching effect on the life of the church, was to declare the bishop of Seleucia-Ctesiphon as the primate of the Church of the East; and in recognition of this pre-eminence he was given the title ‘Catholicos’. The Synod confirmed Mar Isaac as Catholicos and Archbishop of all the Orient. The Synod also declared its adherence to the decision of the Council of Nicea and subscribed to the Nicene Creed. The Canons of the Synod leave no doubt as to the authority of the great Metropolitan, the Catholicos of Seleucia-Ctesiphon. Without his approval, no election of bishop would be valid. Towards the end of the reign of Yazdegerd I, the Christians were again persecuted in AD 420. Dadyeshu was elected Catholicos in AD 421 and himself suffered during the persecution and was imprisoned. When he was released he resigned and left Seleucia, but the church refused to accept the resignation and there followed the Synod of Dadyeshu which met in AD 424 in Markabata of the Arabs under the presidency of Mar Dadyeshu. It proved to be one of the most significant of all Persian synods. The first synod of Isaac in AD 410 had decided that the Catholicos of Seleucia Ctesiphon be supreme among the bishops of the East. The Synod of Dadyeshu decided that the Catholicos should be the sole head of the Church of the East and that no ecclesiastical authority should be acknowledged above him. For the first time, this synod referred to the Catholicos as Patriarch and that their Catholicos was answerable to God alone. This had some effect in reassuring the Sassanid monarchy that the Persian Christians were not influenced by the Roman enemy. The city continued to exist with its surrounding sister cities of whom the Arabs called Mada’in due to the proximity of six cites. 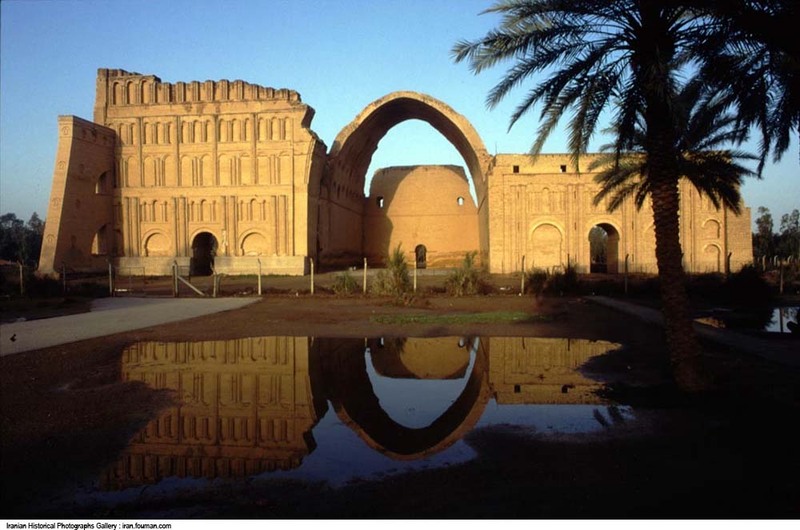 Only when the Abbasid Caliph, Al-Mansour built his new city of Baghdad (30 km to the north of Ctesiphon) and began to use the structural materials of Ctesiphon great palaces to construct his new palaces. Besides the shifting course of the river Tigris away from the city, led to the rapid decline of the city as a commercial center. Then the entire metropolis comprising of the six cities was abandoned and eventually faded into obscurity and was swallowed by the desert sands.